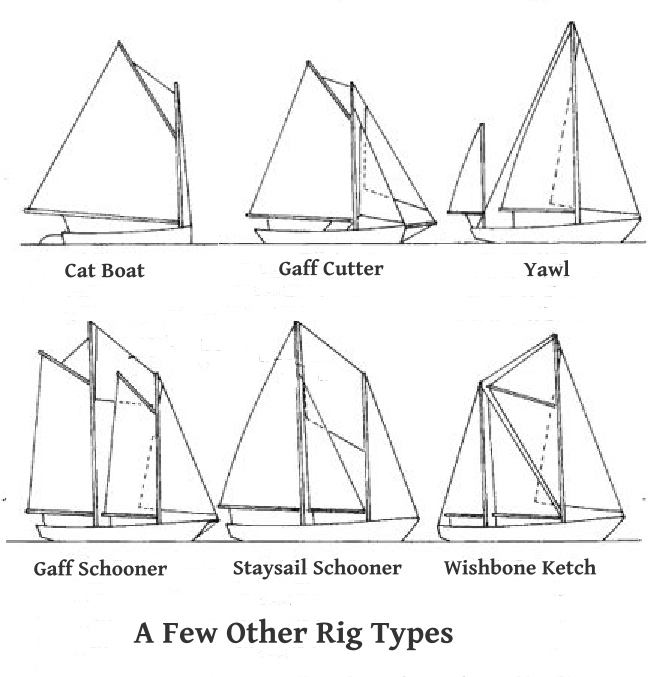 To continue my thoughts on what's important in a cruising boat, I'll talk about rig options – sloop vs. cutter vs. ketch – all of which we've had at least a little experience with. I won't talk much about schooner, yawl, junk, gaff or catboat rigs; while they have their own loyal followers and offer their own unique advantages and disadvantages, I have no first hand knowledge, and can only repeat what I've read or been told about them. Since there are only two sails, they must be large. As boat size goes up, so do the size of the sails, making them harder to handle. Most cruisers we know don't change their headsail on a passage. For example, we hank-on whichever headsail will be the best for a particular passage, be it a 90% Yankee or a 120% genoa, then rarely change it once we set out. It's just too difficult for a short-handed crew to manhandle, fold and stow a large headsail in a seaway, and unless it's really important, such as an approaching storm or a damaged sail, we rarely change the headsail at sea. If the crew chooses to use a larger genoa which is designed for light air, it may not hold up in strong winds. If they use a smaller jib built for heavier winds, it won't perform well in light air. When the wind pipes up, assuming the headsail is on a roller furling, the headsail is reefed by rolling it up. This in turn spoils the sailshape, reducing the ability to sail to wind. As the headsail and main are reefed down, the center of effort is pulled forward, making the boat more difficult to balance and harder to handle. By adding an inner forestay and a staysail, the ability to adapt to differing winds is greatly enhanced. On passages where we may run into a wide range of conditions, we use a 90% yankee as our headsail combined with a heavy staysail. In light winds, we have all sails up. As the wind picks up, we reef the main and begin reefing the headsail. If it increases more, we furl the headsail and use only the triple reefed main and reefed staysail, or the staysail alone – either to run with the wind or to heave-to. If we encounter a full storm, we replace the staysail with the storm jib, the main with the storm trysail, and either heave-to or deploy the series drogue. There are additional costs involved for the added rigging, sails, roller furler, etc. It may be difficult to tack the headsail if the inner stay is not placed far enough aft. Either a running backstay or an intermediate backstay is often necessary to keep the mast straight when using a staysail. A running backstay requires more steps and effort when tacking, while an intermediate backstay reduces the amount the boom can be rotated forward when sailing downwind. The same sail area can be divided between more sails, making them more manageable, especially for larger boats. A great deal of flexibility in sail plans for whatever weather is encountered. The mizzen mast makes a great protected platform for radar sets, wind generators, and antennas. A cutter rigged ketch provides even more flexibility in sail area. The mizzen boom works well as a crane for lifting the dinghy or engine onto the aft deck. Much more expensive with the additional mast, boom, sail, rigging, etc. The second mast uses up more space both on deck and below. We've met many an able cruiser in some pretty remote parts of the world who got there on sloops, but, all-in-all, we prefer our cutter rig. If Cups was much bigger, however, I think we would've opted for a ketch.